Do you want to win this beautiful Viva Beads All Clay Bracelet which features an array of beautiful color coordinating beads? 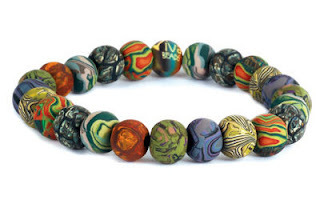 Every 8 mm, handmade, polymer clay bead is strung on industrial-strength elastic string. This All Clay Bracelet measures 7.5". To enter this giveaway, simply become a follower of this blog and write "giveaway" in the comments section. Entries accepted until 4-19-09 and the winner will be notified on 4-20-09. Good Luck! Giveaway! I love LDesigns!!! Lisa has such a good eye for color, fit, texture, etc. I can never go wrong with LDesigns!!! Giveaway! What a great blog Lisa! Beautiful bracelet! I love a good giveaway!